Yesterday was a hard day, but a good day. Thank you to my sister (siblings help so much at times like these), Reverend Johnsan David (and helpers) at St David’s Anglican Church in Moorabbin for accommodating us, Brian at Mannings Funerals, Laura and the others at South Eastern Private Hospital, all the others who helped this week and attended yesterday, and everyone else for your thoughts this week. Thank you for coming today. I especially want to thank Uncle Frank, dad’s younger brother, who has travelled from Brisbane to be here. Some of you have known Dad since well before my sister and I were born. Many old friends of his from around Australia have been in touch over the last few days, and we are learning more about his incredibly diverse life every day. It’s not that he kept his past life a secret, but clearly there was a lot more to him than he talked about. As a young man, Dad had a teaching scholarship taken from him when the authorities discovered he was of Chinese heritage. He felt strongly about this and it lead him to fight against the establishment for what he believed was right. While editing Semper Floreat, the student newspaper at the University of Queensland, Dad was very vocal, including railing against the mainstream media. I always meant to ask him what he thought of today’s impending downfall of the mainstream media due to advances in technology. Dad’s intellect was amazing. His interests ranged across theology, philosophy, history, literature, politics. He was a remarkable reader, dedicated to ideas, with an incredible memory and breadth of understanding. When Susannah and I were growing up, Dad didn’t live with us. But he was never far away. When we lived in East St Kilda, he lived just down the road. When we moved to Elwood, and later to Elsternwick, he moved nearby. I doubt that was a coincidence. For myself, family and personal relationships aside, the two biggest things in my life today are the technology I use at work and at home, and my advocacy of public transport. And Dad helped me find both those things. When I first got interested in computers, he bought one for me. He may not have understood computers, but he could see it was important to me. I’d found my calling: it took me through university and into the workforce, and for my “day job” I still work with computers. At some stage I decided I liked train travel. So he took my sister and I on trips; one day we rode all the way to Hurstbridge and back just for the ride. He showed me magazines he’d got from some mob of troublemakers, then called the Train Travellers Association… they sparked my interest, and you’ll know how that turned out. I hope Dad has found himself in heaven. I hope his heaven is a huge library, with books and magazines and journals from theology, history, politics, literature, and a special focus on 1950s culture, and well read people to argue and debate with. And when he asked for some Sassoon poetry, and she couldn’t find any and brought him Wilfrid Owen instead – she said she was sorry it’s not what he wanted but she thought he’d like Owen. And he said “of course I like Owen, who doesn’t?” – Susannah likes his vision of the world where everyone likes good poetry. Dad’s friend Christopher Koch wrote a well known book “The Year of Living Dangerously”. 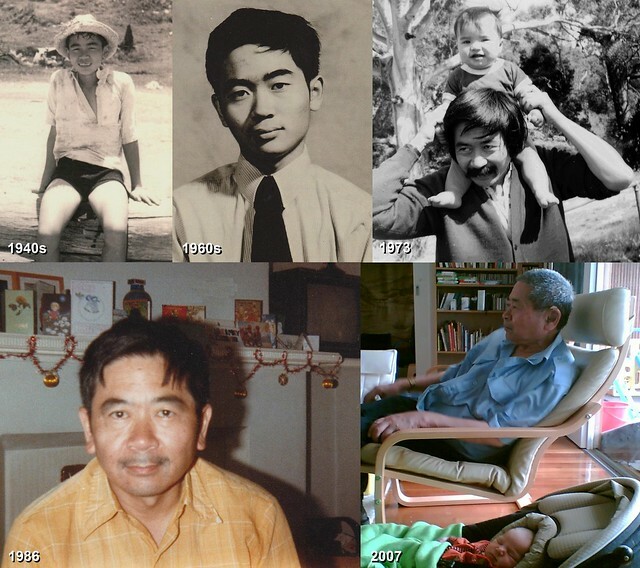 Dad used to say the Chinese-Australian photographer in the book, Billy Kwan, was partly based on him. I’m not sure I really believed it until I read it. The character in the book calls everybody “Old man” — Dad used to call me that. Kwan was one of those people who rarely answer questions directly, and who start conversations in the middle. Another long term friend, David Malouf, has offered to write a memoir of Dad. That would have meant a lot to him, and it will mean a lot to us in helping us remember him. In the last year or so, Dad had a helper to get him to medical appointments and to the library. My sister and I would sincerely like to thank Karen, who made such a difference these past twelve months. Dad had had a difficult time of late. Ten years ago or so, an accident with a cyclist triggered a series of hospital visits, and sent him on a downhill slope. It was a blow for him when his dear friend, Louis Green, passed away in 2008. Thank you Louise, for coming. But in the past few months, with Karen’s help, he’d regained an interest in reading, and whenever I saw him we’d chat a bit about politics. I’m sure he’d have been interested to see tomorrow’s election result. [John] was a remarkable man, as I’m sure you know. He had a first-rate intellect, and a vital mind which often stimulated me when we were young. His tragedy was – and I’m sure you won’t mind my saying this – that some inner divisions stopped him from realising his full potential. I’m sure, though, that he’ll remain a vivid memory to all his friends. There was no-one else like him. Sorry to hear of your loss. My sympathy to you and all your family. That is a lovely eulogy. I lost my dad over 5 years ago and i too was amazed at how much about his life I only learnt after his passing. My dad also tried to buy me a computer once but with less success than yours – he came home with a monitor and keyboard and couldn’t comprehend what could possibly be missing! Your dad had a really interesting life, he was content to go when he did, and that was a lovely eulogy. You can’t ask much more out of life than that, I think. That was a lovely set of words and one I found worth taking the time to read. I’ve been without my Dad for some 14 years now and the hurt still “bubbles up” from time to time. When I see something he would have liked or if I hear myself use a phrase or laugh in a particular way and I can hear him! But this can be a joyful thing, too, a reminder that will always be there. Whatever anyone’s beliefs, we live on in those we inspire. Our condolences – I hope you’re doing okay. Thank you for sharing your eulogy. There are important and yet secret family histories that we only find out about after their passing. Your Dad sounds like he made a huge impression on many folks. He sounds like a truly remarkable man who will be sorely missed. How lovely he is thought of so well by his family and friends. Daniel, thank you for sharing these personal words. It sounds like he was very much admired and loved. My dad passed away over 6 years ago. Time has moved along so quickly and my life is so different to what it was when he was alive but he is a constant, and never too far from my thoughts. It seems there will be many people remembering your dad. A wonderful legacy. What a wonderful eulogy for your dad. You’re very brave in sharing it with us, your readers. Thanks. Thank you for your eulogy. I can’t imagine how hard it must have been to stand up there and read it. I’m sorry to read of your loss. I hope the memories of happy times with your dad brings you comfort at this sad time. I lost my father on March 1st of this year and memories keep flowing. Thanks for sharing this with us, Daniel. Just from your eulogy and the photos, you can see he was extremely intelligent and has a kind face. I’m lucky enough to still have my father around and your story of him buying you a computer resonates. I was fairly good at art and because my father was a high school teacher (chemistry and biology) he heard the art teacher saying that she loved the pottery cottage I was doing. That night he dragged in a one hundred KILOGRAM bag of wet clay through the back door! I’ve been away from my computer for about a month, so have only just caught up with this diary entry. My sympathy for your loss, Daniel. Wow, what an interesting man your dad was! I wish I’d known him – from the description in your eulogy, I think I would have liked him very much. I do hope that David Malouf is able to write the promised memoir. It’s clear you have inherited many things from your dad, not least your own intellectual curiosity and passion for social justice. I’m sure he was very proud at how his son turned out.